Whether you need to communicate with one person, a few people or large groups, Voodoo’s video-enhanced email engine is the ideal platform. Quick Send lets you add a new contact, add them to your choice of contact lists, send your message, and choose Automated Action Alerts and auto responders…all in one place. 1. You meet a new prospect at a noon luncheon who confides in you about a business challenge. Your company can solve her problem, and you have the perfect video to explain how. 2. Before you even leave the table, you pick up your smartphone and drop her contact info into Voodoo. At the same time, you add her to a targeted list, send a pre-built video message, and choose to receive an Automated Action Alert as soon as she watches. 3. At 1:50 pm, your uninformed prospect watches your video and gets all the information she needs to understand your solution. You get notified and call her right away. In superhuman time, you negotiate terms and close the deal. Email Templates, Campaigns & Custom Fields let you control every aspect of your communications to small or large groups. Build hyper-personalized templates using data from unlimited custom fields. No one needs to know you sent the same email to your whole contact list. You’re in charge of a large territory and hundreds of customers. Every one of them needs to feel like they are the most important customer you have. Enter Voodoo. 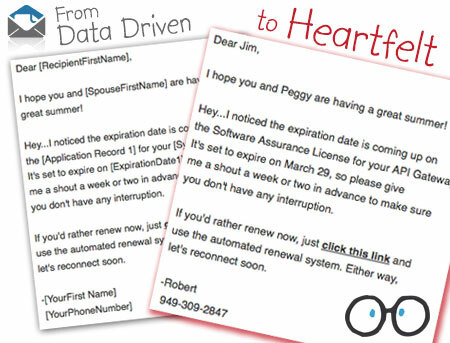 Custom Fields hold all the data that’s critical to your business relationships. Everything from spouse's and kids’ birthdays to vital business data like products purchased and expiration dates. So each email you send is both professional and absolutely personal. Every customer feels like you’re focused on them. You can be off doing other things while your relationships are nurtured automatically, loyalty grows and you sell more than ever. How would you like Voodoo to know when each individual prospect or customer needs to hear from you? That’s the magic of Predictive Messaging. Just tell Voodoo what event, date, or other business trigger should launch a given message. It’s like Voodoo can read your customers’ minds. A customer’s Software Assurance agreement will expire in 6 months. Voodoo knows it and has already scheduled outreach messages that will occur with increasing frequency and urgency as the expiration date nears. 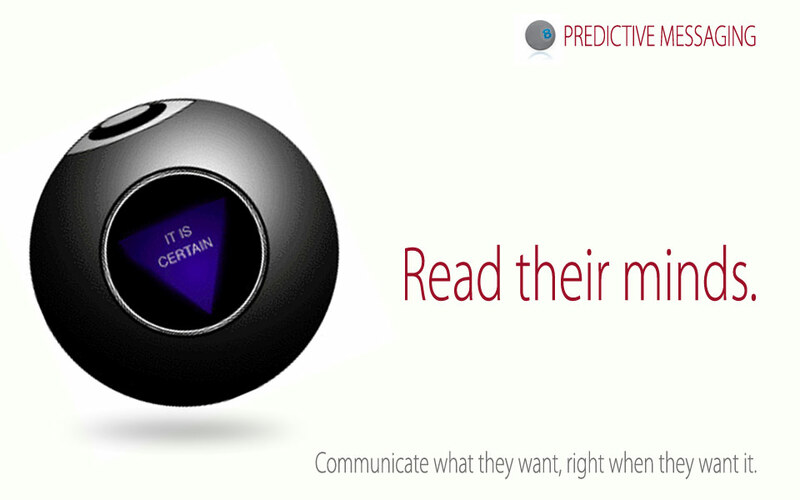 We call these Predictive Sales Triggers. 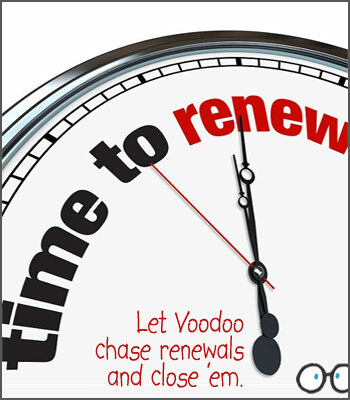 And when the client renews their agreement, Voodoo knows that, too, and immediately shifts from pre-renewal messaging to post-renewal thank-yous, instructions and other content to add value and build loyalty - all automatically and with total precision. Full-featured Capture Forms and HTML Landing Pages. Build them easily and use them anywhere. 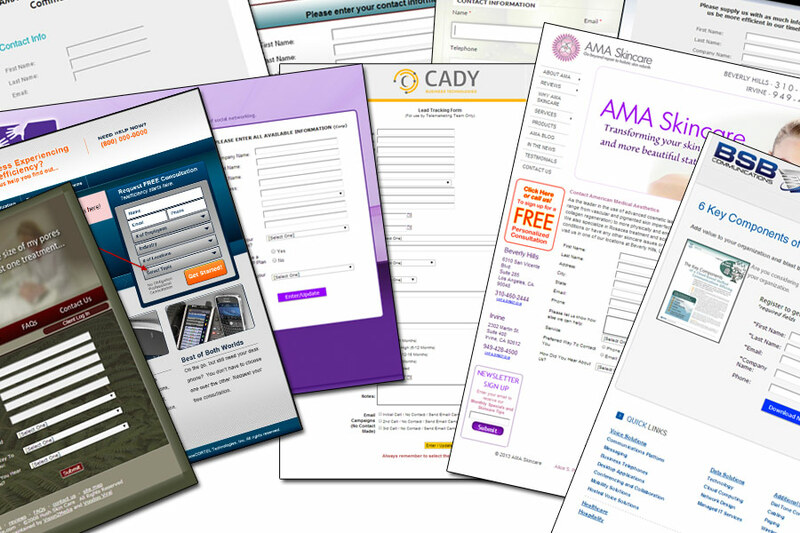 Capture Forms—Voodoo Business Builder Systems include full-featured Forms and HTML Pages. 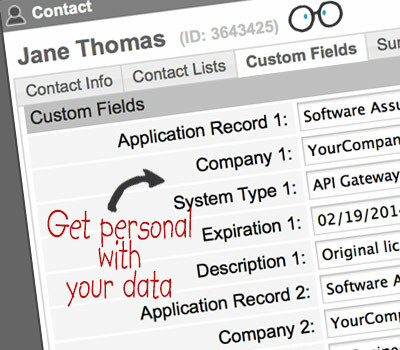 Capture data with ease into built-in data fields and ones you create. 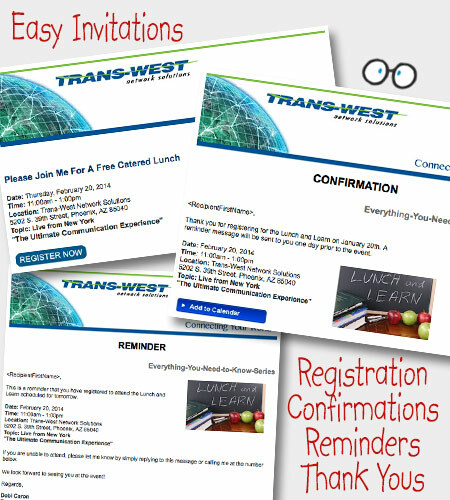 Form content and designs can be stylized and i-Framed into any existing web page. Custom CSS code option allows your forms and pages to match any formatting and font styles. Your trade show booth is a major investment. 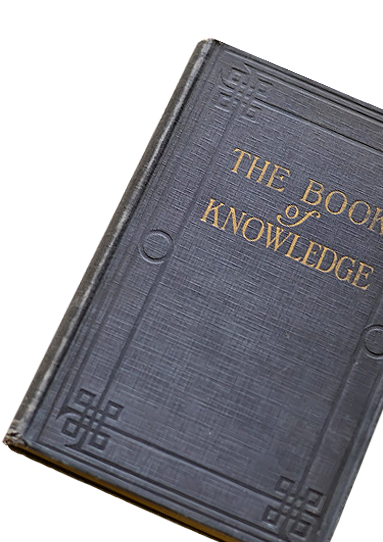 Don't leave it to a merciless trade show producer to capture your leads and determine what, when and how you get that information. Why not generate maximum impact with minimum work—and a lot less risk? Voodoo gives you secure, instantaneous lead capture and the ability to customize and automate every aspect of your lead nurturing. 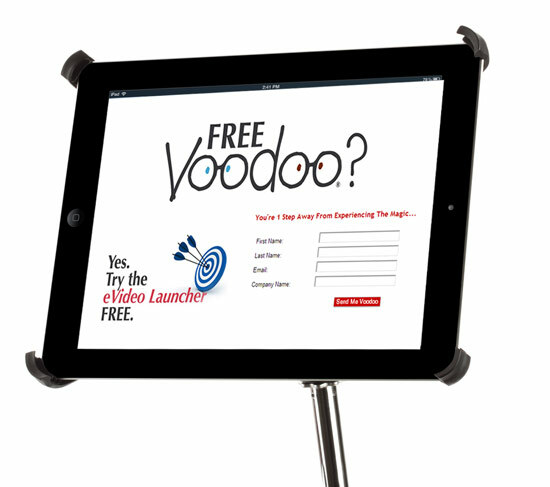 An iPad® mounted to a mic stand displays your custom-branded capture form. Intrigued visitors simply enter their name and email address. 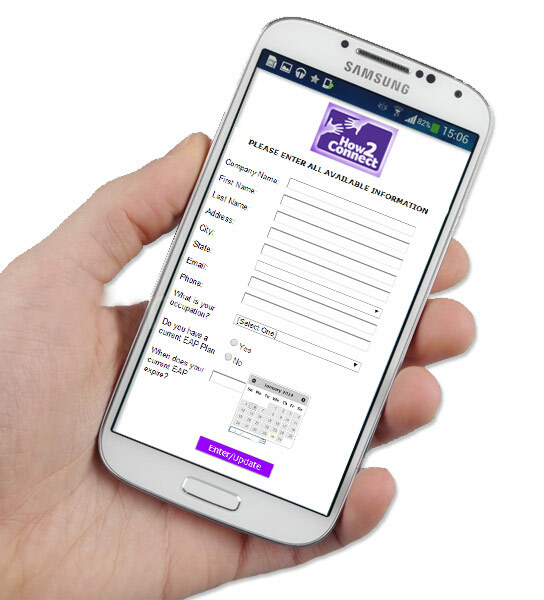 They’re instantly added to your Booth Visitors contact list, then automatically nurtured with your choice of content—even before they leave your booth. 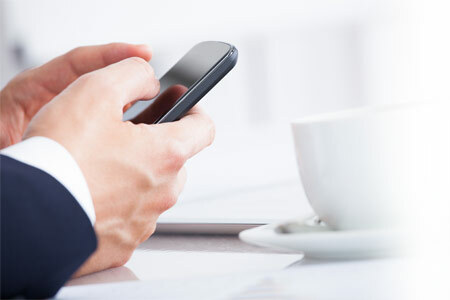 It’s 100% automated, and it makes quite an impression when your visitor’s smartphone buzzes and they see the message they just received from you. A lead Capture Form from one of Voodoo's own trade show booths. Magic Landing Pages—by leading targeted traffic to landing pages that speak to unique interests and needs you can increase engagement and sell more. Landing pages created in Voodoo are magical. They offer a full complement of HTML editing capabilities, but you can also easily add video, dynamic personalization, smart surveys and integrated capture forms — and of course, all trackable with real-time notifications and reporting. 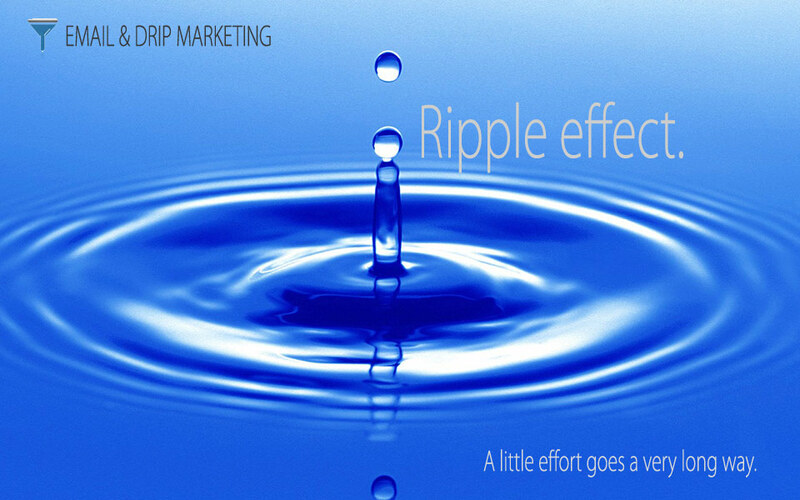 Your video-enhanced website serves inbound traffic beautifully. But when you discover a vertical market "sweet spot,” you need to communicate targeted information to engage and inform them. So…you create unique landing pages in Voodoo to serve inbound traffic from vertical pay-per-click ads, affiliate links and other sources. One page offers a new eBook as an incentive to fill out a form. Another page captures event registrations. Still another signs up subscribers for your industry-specific newsletter and blog. 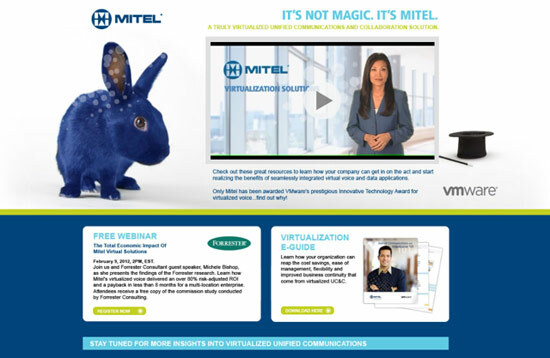 Mitel-VMware landing page with live video, webinar and whitepaper. Click the image to view example. 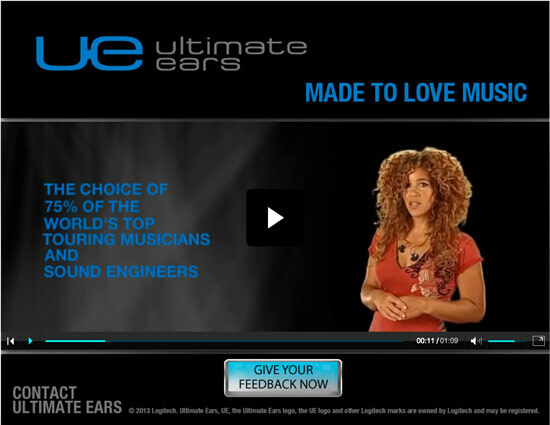 Logitech-Ultimate Ears Landing Page with Survey. While Voodoo isn’t a CRM, sometimes it kind of acts like one. Import your lists directly from the most popular cloud-based Address Books like Gmail, Yahoo, and more, or from local contact databases in Outlook and Apple Mail. Or import from your Salesforce account and update Contact Activity History automatically. Segmentation and list maintenance are easy with list adding, copying, merging and de-duping. You can also feed your lists from external sources like capture forms, affiliate sites, order and accounting systems - you name it. With unlimited lists and rules-based automation, it's a breeze to modify, update, move and remove contacts based on user behavior, business triggers and changing data fields. 1. 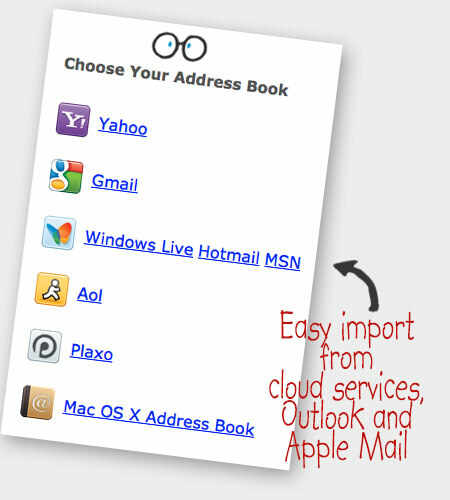 Voodoo’s Address Book importer brings in your choice of contacts from your Gmail and Outlook accounts. Voila…812 people ready to receive. 2. Next, Voodoo’s smart importer brings in your Excel® list of 573 old customers. Full field mapping brings in all your data, complete with Custom Fields. 3. 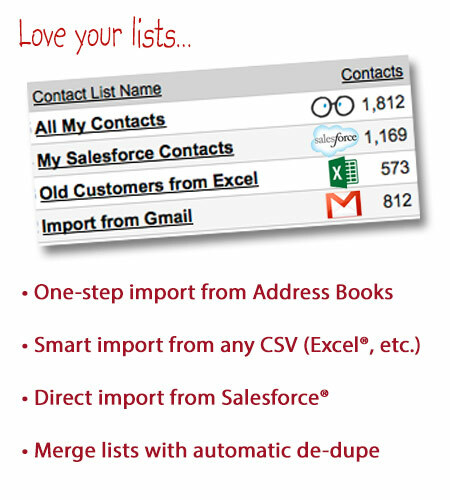 Third, you link Voodoo to your Salesforce account and import 1,169 more contacts with one click. Now you want to reach out to all of them, so you merge the three lists to get a master list of 2,554 total, right? Wrong. Voodoo automatically de-duplicates your contacts no matter where they originally came from. Segment contacts by region and assign them to specific reps. Poll your contacts to understand their preferences, interest in certain products and readiness to buy. 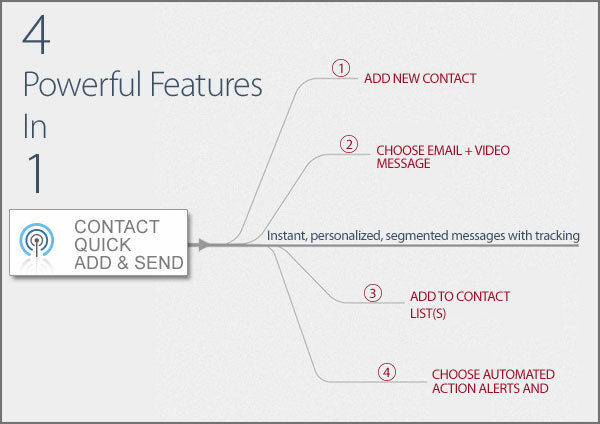 Manage each contact's outreach profile based on survey responses and other automated triggers. And almost anything else you can imagine. Voodoo Surveys are “smart" because they're tied directly to your contact records. 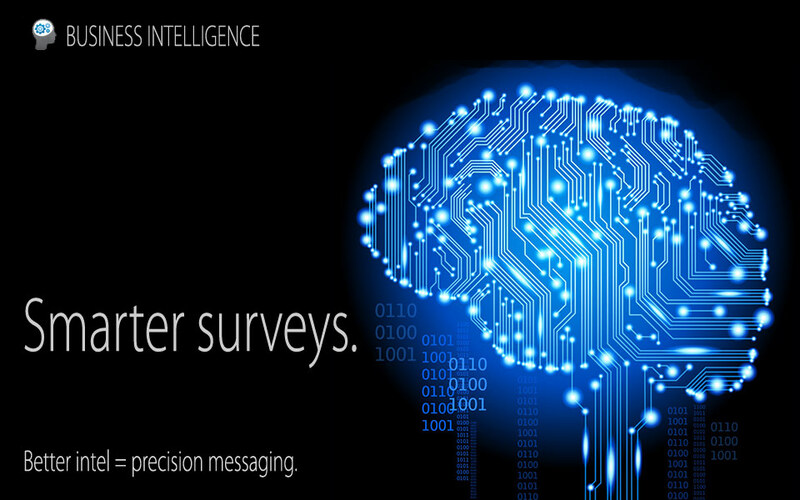 Voodoo Smart Surveys are an essential business intelligence advantage. 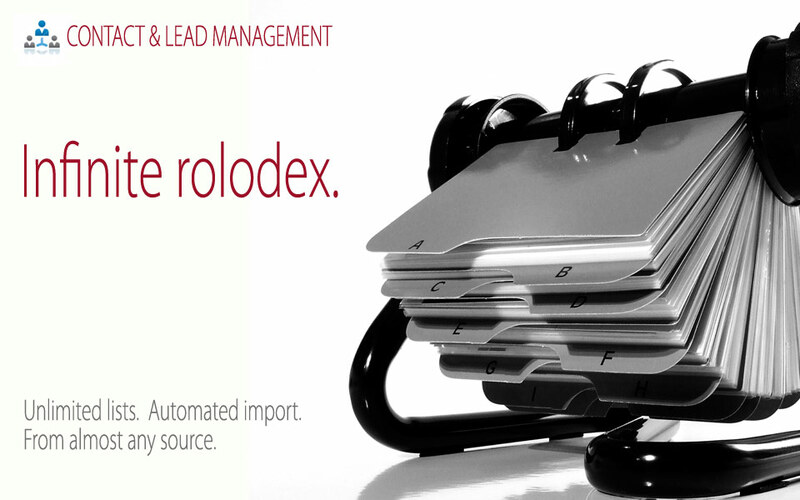 They help your whole organization work smarter, not harder…automatically. Because every time you poll a group of contacts for information, opinions, interests or other feedback, every answer adds to the contact profile. This fleshes out Voodoo’s “understanding” of that person’s motivations and needs. What's even smarter, individual answers in any survey can be used to add and or remove the contact from specific lists and nurturing paths. Or to notify you when the contact is ready to buy. Magical pre- and post-event communications...all with a lot less work. Voodoo lets you manage a single event or a whole series of events painlessly. 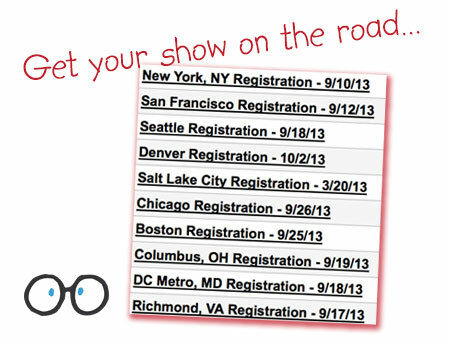 Let’s say you have a multi-city roadshow and you’re responsible for the whole shebang. 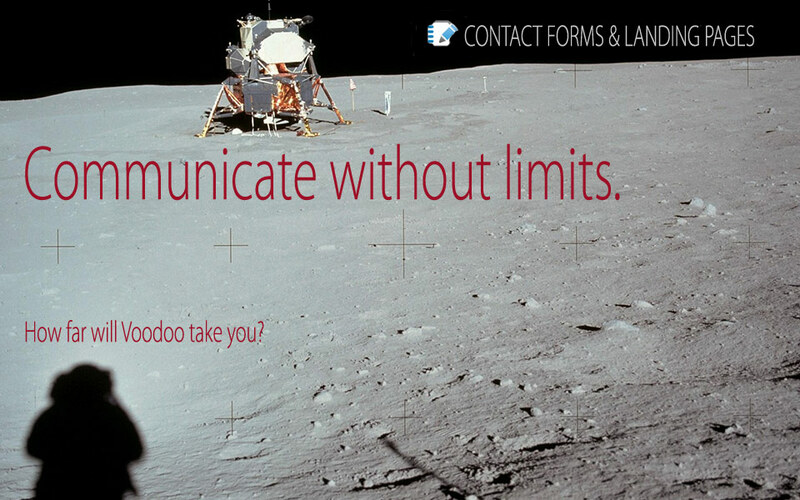 Voodoo handles it all with ease and eliminates unnecessary calls and emails to your event staff in each location. Set up separate invitations and registrations for each city with simultaneous centralized and local registration management. Set up local events to send real-time notifications to whomever you need—so Denver’s conference center knows to expect 332 attendees, and Dallas' caterer is ready to serve 210. Automated reminders keep people pumped up and ensure maximum attendance. 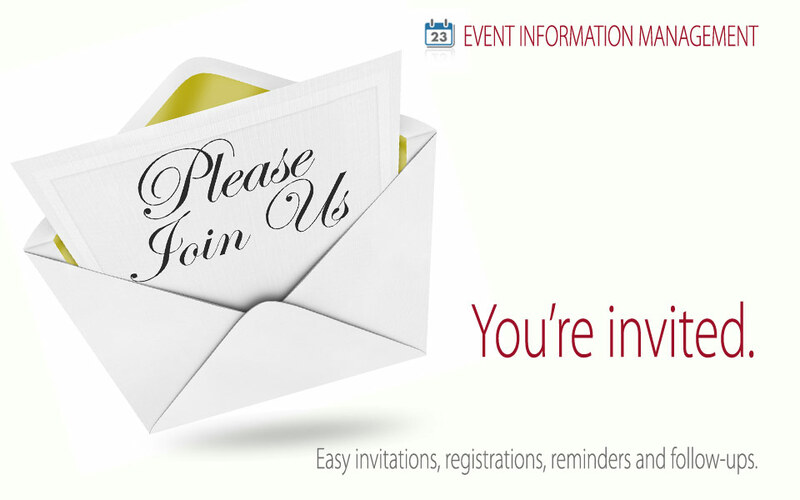 After the event, using capture forms, list automation, and message templates, you’ll reach out with unique content tailored precisely to those who attended and those who didn’t. Your partners will thank you for it. Your executive team will thank you even more. 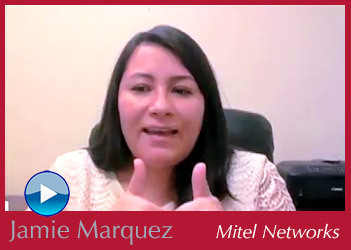 Channel Enablement is a hot topic with good reason. Co-op dollars are a significant expense, often generating vague return on investment. Harnessing your channel partners is difficult with most so-called marketing “solutions.” Even with an established reseller portal, lots of VARs will go rogue and do their own thing. Voodoo changes all that. Voodoo turns basic channel enablement into major channel empowerment. 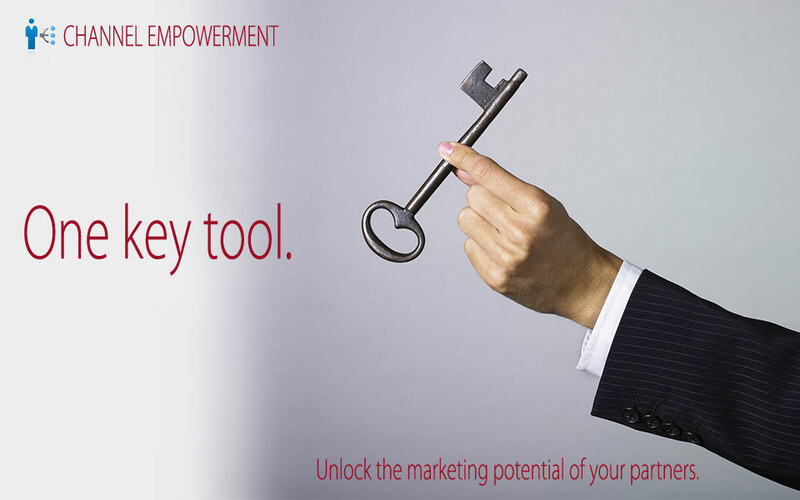 With your choice of the full-featured Voodoo Business Builder or the “lite” and absolutely foolproof eVideo Launcher, or both, each partner gets just what they want and need to promote your products more effectively. Without lifting a finger, each partner gets instantly and automatically co-branded email + video content. Optional Digital Business Card personalization flows right down to the rep level, enhancing response by 3-7% on every campaign. Payment is flexible with whole or partial co-op funding and credit card payment options when you want your partners to have skin in the game. Say you have 100 channel partners. 20 are top-level, 30 mid-level and 50 lower level. Voodoo lets you set up the perfect mix of channel empowerment tools for each level. One set of videos and related content serves them all. And every partner gets to experience the power of Automated Video Communications to promote your products, pre-qualify prospects and sell more with less effort. Want to incentivize and reward your top partners? Give them fully subsidized access to Voodoo’s complete toolset, while giving lower level partners limited funding and more basic tools. Voodoo works with you to build the Channel Enablement and Empowerment tool you need to achieve co-branded, professional and personal marketing through the channel. I want to empower my channel. Sign me up for a Voodoo tour. © Voodoo Video Marketing Magic / Voodoo LLC. All rights reserved. Various trademarks held by their respective owners.